Per McCord, new WSU stone-fruit breeder, inspecting and pruning young cherry trees in the Roza research orchard near Prosser. PROSSER, Wash. – Somewhere among the thousands of young trees at Washington State University’s Roza research orchard near Prosser are future cherry varieties promising wider harvests, disease resistance, and more firm, flavorful fruit. Per McCord is here to find them. 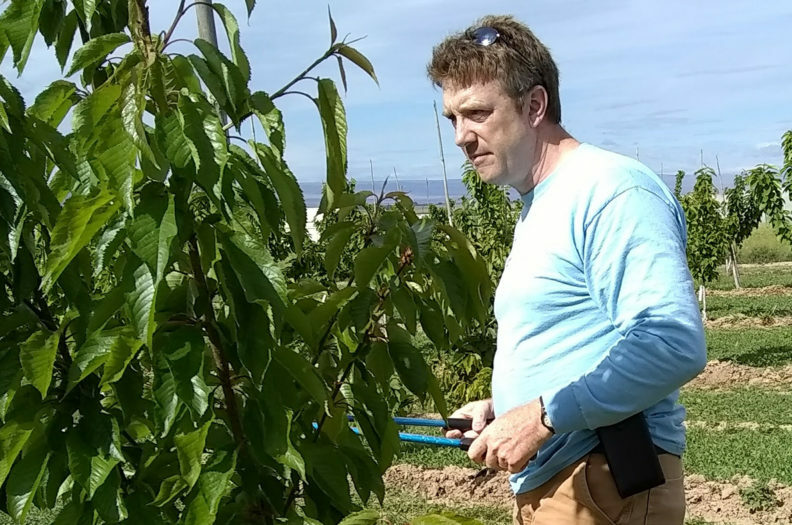 As the new cherry breeder at WSU’s Irrigated Agriculture Research and Extension Center in Prosser, McCord will use the latest technology to speed the breeding of new varieties for Washington’s half-billion-dollar cherry industry. Washington is the number one producer of cherries in the United States, and it was WSU that developed the Rainier blush cherry seven decades ago. Today, growers are eager for new cherry varieties, and McCord, who was hired April 1 to head up WSU’s stone-fruit breeding efforts, has set his first priority on selecting lines that promise disease resistance, high quality and, most of all, a wider window of ripeness. As the university’s stone-fruit breeder, McCord’s role also covers peaches, apricots and plums. But his top crop, by far, is cherries, and McCord is meeting with Washington cherry growers this summer to better understand their needs and priorities. McCord comes to Prosser from Canal Point, Fla., home of the U.S. Department of Agriculture’s sugarcane variety development program. There, McCord bred better cane for that state’s billion-dollar industry, but also researched ways to improve the breeding process itself through the discovery and development of genetic markers — pieces of DNA that tell scientists if a plant will carry a given trait. McCord sees similarities between cane and cherries, notably their annual breeding cycle and labor-intensive cultivation. Understanding those challenges should help him more quickly establish an effective cherry breeding program. At WSU, McCord is excited to be able to work with the genetic markers developed by WSU faculty, such those developed through the USDA-funded RosBREED project. McCord looks forward to crossing new genetic material, developing selections that will one day become future varieties. In the near term, he’ll be testing the thousands of young trees already in the breeding pipeline to meet a variety of goals. There’s also a lot that goes into cherries that the consumer doesn’t see, such as resistance to cracking, and the ability to survive cold snaps and bear fruit at a younger age. Working with other WSU scientists, McCord aims to breed resistance to diseases — notably cherry powdery mildew, which covers cherries in a white, unappetizing fungus and is a major problem for Northwest growers. Per McCord, associate professor of stone-fruit breeding, 509-786-9254, phmccord@wsu.edu.